Mailigen is devoted to one thing: making email marketing as easy as possible for businesses of all sizes. Based in Europe, their company was the result of a lack of good email management services in the area. Since 2006, they’ve been providing the most intuitive email marketing system to businesses around the world. Constantly developing new ways to keep up with the rapidly advancing world of marketing and email technology, Mailigen’s mission is to make your email management as simple and cost effective as they can. While Mailigen promotes simplicity and ease of use in their mission statement, they do offer a variety of advanced features that you can take advantage of, particularly social media management. You aren’t limited to only email campaigns; they’ll help you get your message across Facebook, Twitter, LinkedIn, and even text messages so that your clients get the message in whatever way works best for them. They also use Google Analytics to provide the data you need, such as clicked links, unsubscribe requests, forwarded messages, opened emails, and so on. Once you understand how successful a campaign truly was at generating interest, you’ll be able to duplicate that success again. Mailigen does not offer nearly the library of email templates that their competitors do. With less than 150 templates to choose from, you’ll be limited by their selection or by your own design skills. You can add images, logos, and links to all of their templates, and they do store your images, up to 10MB worth. They also have a standard auto responder that sends a personalized message to clients who click or interact with your email in predetermined ways. One of the ways that Mailigen stands out is their money-back guarantee. This isn’t something that many monthly subscribers offer, in any industry. Their prices are comparable to competitors, and they offer two tiers to choose from, so lower volume senders can choose the right price for them, while higher volume senders also have multiple options. There’s a 30-day free trial that requires no credit card to get started. A major downside that Mailigen has yet to address is the lack of preview tool. You can’t see what your customers are going to get before you send an email, so it will take you longer to tweak your design while you test it before the launch. 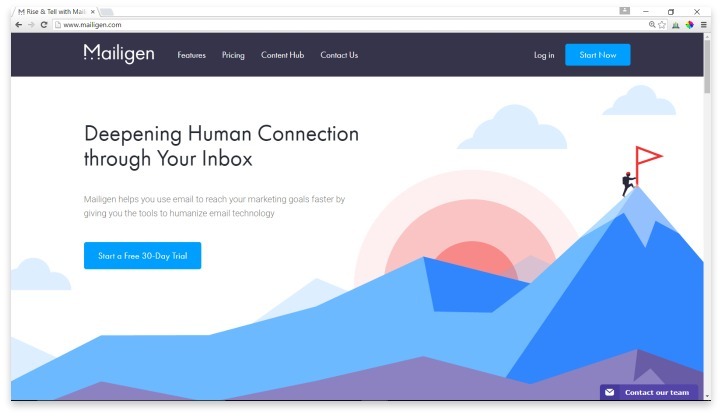 Mailigen does offer an A/B test function, so you aren’t flying totally blind before you send your email to your contact list. Mailigen is devoted to making email marketing as easy as possible for businesses of all sizes. Despite the few glaring cons, overall, Mailigen presents every function that a small business or individual would need to create a very successful campaign. Even without a huge database of templates, their tools allow you to create professional looking emails that have all the media functionality you need. The money-back guarantee is the real winner here. You can try them for as long as you want, completely risk-free, and if it doesn’t work, you haven’t lost a thing. Have you had an experience with this company? Please share your Mailigen Reviews below.